“The right to private property is fundamental to our nation and our economy. Private property owners should not have to be afraid of their property being taken from them by their government. The practice of Eminent Domain is all too often used as an excuse for government to do whatever it chooses, leaving landowners with little recourse to fight back," said Congressman Tom Reed. Private ownership of property is a fundamental right in America. Along with that ownership comes a certain expectation that landowners will be able to legally use their land as they see fit, so long as others are not harmed. Over the years, that expectation has eroded as federal, state and local governments passed laws that impact how a landowner uses his or her land. Furthermore, governments obtain property through eminent domain to use for various purposes including roads, parks, open space and conservation areas and other activities. In the United States, the "taking" of private property is prohibited by the Constitution. Since its earliest days, the Western Caucus has taken a lead role in standing up for property rights, and will continue to oppose excessive uses of eminent domain. Members of the Western Caucus believe that the federal government should be required to compensate property owners when government policies deprive them of the use of their property. Our members advocate for legislation that protects private property from federal government “takings” and is consistent with our Constitution. However, actually getting relief under the Fifth Amendment is difficult for property owners to achieve. Recent Supreme Court actions are particularly alarming, as the Court has seemingly embraced an expansive view of governments’ right to invoke eminent domain to seize private property for other purposes. 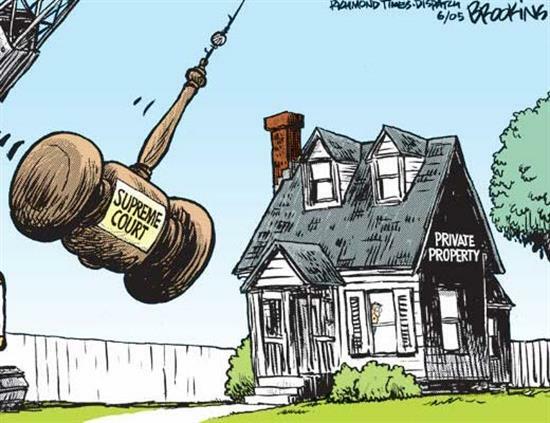 In June 2005, the U.S. Supreme Court ruled in Kelo v. City of New London that local governments may seize private property for development, even if that development primarily benefits a private company. The taking of private property reduces the economic productivity of the land, and decreases the tax revenues needed to support our schools and other necessary public services, in addition to violating of our civil liberties. On January 19th, 2017, the day before President Trump was sworn in, the previous administration published a 234,328-acre federal mineral withdrawal application in the Federal Register, to restrict for a 20-year moratorium, lands within the Superior National Forest in Northeast Minnesota. 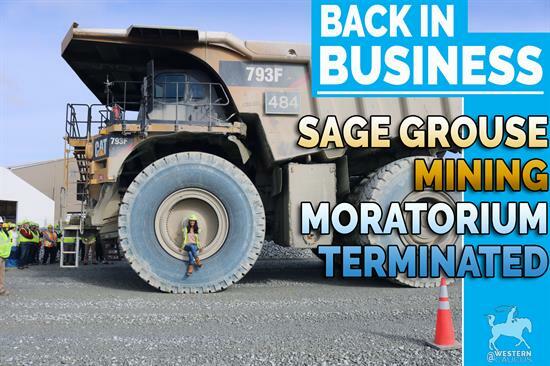 This action immediately placed this vast area off limits to future mineral leasing, exploration and potential development for two years while the 20-year withdrawal is being considered. The total withdrawal application boundary spans approximately 425,000 acres, including 95,000 acres of state school trust fund lands. The Obama Administration’s Bureau of Land Management also inappropriately rejected Twin Metals Minnesota’s application to renew two hardrock mineral leases in Minnesota’s Superior National Forest – leases that were signed in 1966 and renewed without controversy in 1989 and 2004. To date, Twin Metals has invested upward of $400 million – a significant investment – in reliance on the two federal mineral leases that the BLM executed with the company's predecessors and renewed each time they expired. Additionally, the Obama Administration proposed to withdraw approximately 10 million acres of Sage Grouse habitat from new mining operations in an area that contained more than 7,000 active mining claims. While this proposed mineral withdrawal was being analyzed, an immediate two-year moratorium occurred and an additional 20-year moratorium was considered. This withdrawal was shamefully political in nature, as less than 0.1% or 171,000 acres of actual Sage Grouse habitat existed in the 10 million acre withdrawal area. Political mineral withdrawals not based on science should constitute a taking. Shockingly, this is not the case and mining companies still have to pay holding fees after a mineral withdrawal takes place or risk losing their claims forever. The Western Caucus is leading the charge to overturn political mineral withdrawals from the previous Administration. The House passed Rep. Emmer's H.R. 3905, the Minnesota's Economic Rights in the Superior National Forest Act" to reject Obama's Minnesota land grab and mineral withdrawal. Additionally, Western Caucus was the leading voice in Congress that pushed to scrap the 10-million-acre Sage Grouse mineral withdrawal.Click HERE and HERE to read more. 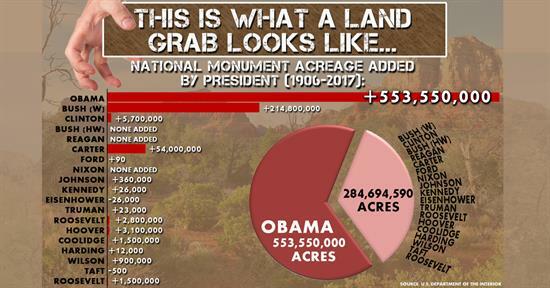 President Obama abused the Antiquities Act more than any other president in history, designating or expanding 34 national monuments and locking-up 553.6 million acres of total land and water.These unilateral declarations have negatively impacted hunting, fishing, grazing rights, water rights and other private property rights. Think of what it would be like to be a property owner, local government official or stakeholder in this situation. One day, you wake up and the President announces he or she has decided that the land you or your community uses and needs is being confiscated. This power that Presidents have seized isn’t just unpopular amongst legal scholars - who note that this was not Congress’ intent with the original statute. It’s also firmly rejected by the communities and local governments who’ve been victims of this law. Members of the Western Caucus have been spearheading the effort to reform this outdated 1906 law. House Committee on Natural Resources Chairman Rob Bishop’s National Monument Creation and Protection Act protects private property rights and empowers local stakeholders.